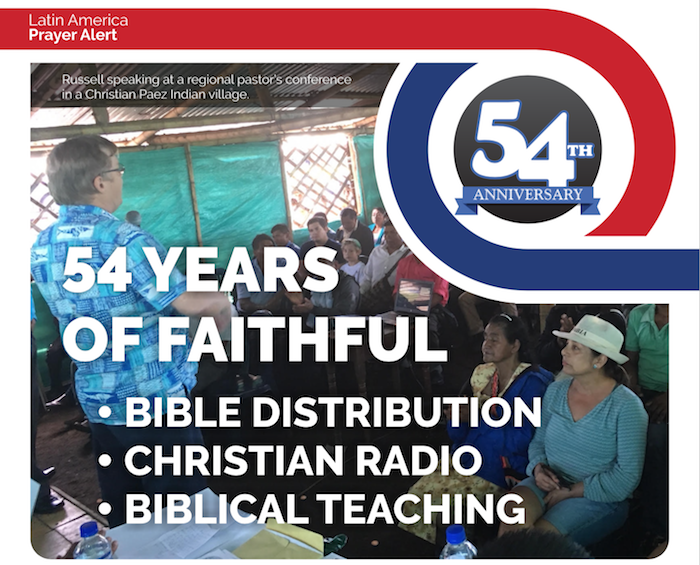 January 2018 marked the 54th anniversary of the ministry of our family in Colombia. In the Book of Genesis, only three men are recorded as responding favorably to God in the first two thousand or so years of human history (Abel, Enoch and Noah). God’s friendship with Abraham, whose faith is held up as an example for all of us, proved to be an important turning point. Jesus Christ, the promised seed of Abraham and heir to all the promises of God, is referred to in messianic Psalms and in prophecy throughout the Old Testament. God has a lot of patience with the fallen human race and has taken many centuries to bring His great plan of redemption to fruition. Now is harvest time. We are thrilled to report that many have come to Jesus Christ here in Colombia, Ecuador and Venezuela over the past year. There are also untold tens of thousands who we are helping to spiritually nourish with literature and Bibles as we preach and teach through each chapter on the radio. Thousands of new leaders are emerging and are on their way to maturity in Christ. Your donation right now will help us with an unprecedented distribution of Bibles in 2018 that will directly impact Venezuela and the Colombia police force.